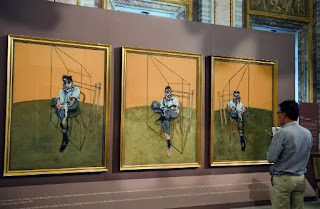 The big news in the art world is the record $142.4 million auction price of a Francis Bacon  triptych (three panel painting) of his friend and rival Lucian Freud . The paintings are large and of an attractive yellow color, and we congratulate the winner on their purchase. An analysis in our book Who's Bigger (page 297) correlates the significance of artists to the (logarithm) of their highest sale price. There is a very strong correlation here (0.52): more significant artists command higher prices. My question is whether Francis Bacon, the artist, is big enough for his painting to justify this valuation. The previous auction price record was held by "The Scream", by Edvard Munch , at a mere $119.9 million. This is a much more famous image, by a much more significant artist than Bacon. We identified over a dozen painters more significant than Munch; indeed we identified a dozen sculptors (a much less elite crowd than painters) more significant than Bacon. 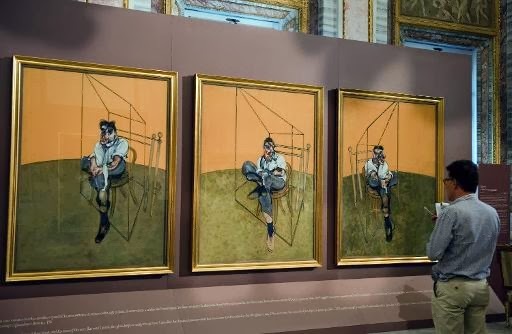 In our price model, the previous top price for a Francis Bacon painting ($86.2 million) was already an outlier as too expensive for his level of significance. You can get more bang for your buck with several classical or impressionistic masters than star modern painters. I also would personally have one of these hanging on my wall, yellow color or not.